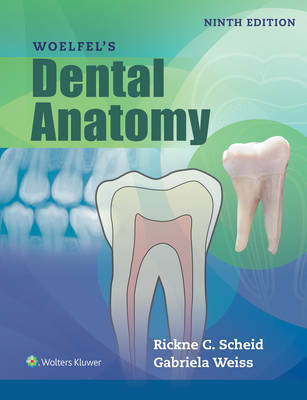 Using clear explanations, a unique three-part organization, full-color illustrations, and interactive exercises, Woelfel's Dental Anatomy, 9e helps dental hygiene students understand the relationship of the teeth to one another and to the bones, muscles, nerves, and vessels associated with the teeth and face. The books detailed coverage of dental anatomy and terminology prepares students for success on national board exams, while up-to-date information on the application of tooth morphology to dental practice prepares them for success in their future careers. Updated throughout with the latest scientific and technological advances, the Ninth Edition features expanded content, new tooth identification labeling exercises, additional board-style learning exercises, and a substantially updated full color art and design program. New to this edition: Revised chapters that reflect the latest scientific and technological advances in Periodontology, Operative Dentistry, Endodontics, and Forensic Dentistry have been updated by faculty with specialties in each area. New Tooth Identification Labeling Exercises, featuring over 80 step-by-step questions that cover the decisions required to identify a tooth, ask students to identify tooth anatomy (class, facial size, arch, type, mesial, and universal number). Additional board-style Learning Exercises in Chapters 2 -5 address the tooth identification and universal numbering system to better prepare students to pass board exams. New content addresses specific topics now included on national board exams, such as paranasal sinuses and dental anomalies. A substantially updated art and design programintroduces "red dot" markers for tooth identification and new color photos that better illustrate specific characteristics or traits of the tooth. New Glossary of Key Terms appears at the back of the book for easy reference. Halmark Features: A unique comparative approach to tooth anatomy in Chapters 1-6 helps students understand the similarities and differences of each class of tooth. Topic Lists open each chapter in an outline format to orient students to the information that follows. Section-opening Learning Objectives allow students to read with a purpose and to assess their mastery of important knowledge and skills. Summary Tables capture complex material in an easy-to-understand format. Research Data sections provide both original and reviewed research findings based on thousands of teeth, casts, and mouths. Review Questions and Answers inserted throughout chapters help students assess their understanding of anatomical terminology and concepts and prepare for certification examinations. Learning Exercises that help students understand and apply topics include interactive activities, such as examining extracted teeth or tooth models or performing specific self- or partner examinations. Advanced Learning Exercises in Chapter 13 ask students to draw and sketch teeth or carve teeth from wax to help them become intimately familiar with tooth shape and terminology. Additional board-style Learning Exercises in Chapters 2 -5 address tooth identification and the universal numbering system to better prepare students for success on board exams. Chapter-ending Critical Thinking Questions give students an opportunity to apply what they've learned to more complex questions/exercises. A free, printable online dental anatomy study guide helps students master key information and includes traits, charts, and reference information.